There's been this increasing disparity between the rich and the poor, and we found out that a rising tide just lifted all yachts, not all boats. Warren Buffett has been practically begging the country - begging the congress to tax him more. In fact many of the richest Americans like Buffett, Bill and Melinda gates and ted turner say they should pay higher tax. BUFFETT: the rich are always going to say that you know, just give us the money and we'll go out and spend more and then it will all trickle down to the rest of you. But that has not worked the last 10 years, and I hope the American public is catching on. The debate over whether the rich should pay more taxes takes place outside Washington, DC as well. In Washington State for instance where Bill Gates Sr. has been passionately championing a new tax on the rich. Washington is one of seven states with no state income tax. AMANPOUR: Proposition 1098 that was in Washington state to try to bring a wealth tax championed by Bill Gates, Sr., supported by Bill Gates, it failed. BUFFETT: Right. Got beat pretty badly, but I really admire Bill Sr. for what he did on this. I mean there's a guy that's going out and trying to do something for his state and, unfortunately, lost. AMANPOUR: What do you say though to the executives? One, apparently, was even a Microsoft executive who spent a lot of money trying to defeat that. BUFFETT: they're not alone in those look at who fights in terms of the estate tax and in terms of higher tax rate. That's what K Streets all about in Washington. And, unfortunately, the politics is a game of push and pull and you get to push with money. AMANPOUR: Are you disappointed that it got defeated? B. GATES: I voted yes and I was hoping that it would pass. But that's done now. AMANPOUR: If people aren't going to pay for the services that they need, how are those services going to get funded, do you think? B. GATES: Well, taxes and spending have to match each other in the long run. There's many ways to tax, there's many ways to spend. That's all up to the voters. Some states, you rely on your legislators to do that. Some, you have lots of referendums. AMANPOUR: Do you agree with the former Federal Reserve Chairman, Alan Greenspan that all Bush era tax cuts should come to an end? BUFFETT: no, I think -- or actually you might extend them further for the lower class, middle class, maybe upper middle class but I think that you should raises taxes on the very rich. I lived in periods where capital gains taxes were 39.6 percent, when earned income taxes were 70 percent and our economy did just fine. BUFFETT: I think that it hasn't been to the interest of the people in Washington to get as riled up about that as they get riled up about other things. You know, we're going to raise $2.2 trillion this year or something like that. Nine hundred billion will come from individual income taxes. Nine hundred billion will come from payroll taxes. So the payroll taxes become 40 percent of our total revenue just like the income tax. And people that talk about how the rich pay their share and all that sort of thing, they totally ignore the payroll tax. You know, I did this little survey in my office a few years ago and there were 16 people who responded. And I had the lowest tax rate of the 16. I didn't have any tax shelters. I didn't have any tax planner. It was all courtesy of the U.S. Congress. I mean, they did my tax planning for me. And, literally, the average for the office, counting payroll taxes was 32 percent and mine was 16 and a fraction percent. AMANPOUR: their rationale is that by giving you a tax break, so to speak, which is what it amounts to, you help all the others...that it trickles down. BUFFETT: Yes. Well, all I can say it hasn't trickled. You know, as I said, a rising tide has listed all yachts, but the row boats have been left behind. TURNER: I still pay quite a bit of taxes but not as much as I would if I didn't give so much money away. I get a lot of deductions. TURNER: Well I don't like it. I paid for Social Security. It's my own money I'm getting back. Social Security, we get taxed for Social Security. In my opinion. I think Social Security -- since you paid for it, it's yours and you're entitled to get it. BUT EACH OF THESE MULTI BILLIONAIRES SEEs NEEDS THAT ARE NOT MET…THUS THEIR CALL TO OTHERS LIKE THEM TO JOIN THE GIVING PLEDGE. BUFFETT My wealth has come from a combination of living in America, some lucky genes, and compound interest. (Both) my children and I won what I call the ovarian lottery. WARREN BUFFETT, WHO IS CEO OF BERKSHIRE HATHAWAY AND ONE OF THE WORLDS'S RICHEST MEN HAS PLEDGED TO GIVE AWAY 99% OF HIS FORTUNE. TODAY, THAT'S WORTH 50 BILLION DOLLARS. AMANPOUR: was it difficult at first to sort of go from making that money to giving it away? Did your hands shake? Did your heart stop? BUFFETT: No, it was not difficult to make the decision. My wife and I made the decision back when we were in our twenties that we were going to do it. The question was how to do it. And it's much easier to make it than it is to give it away intelligently. We have been blessed with good fortune beyond our wildest expectations and we are profoundly grateful. But just as these gifts are great, so we feel a great responsibility to use them well. BILL GATES, FOUNDER OF MICROSOFT IS ALSO GIVING AWAY HIS MONEY. AND APPLYING HIS INNOVATIVE SMARTS TO TRYING TO SOLVE SOME OF THE WORLD'S BIGGEST PROBLEMS. ALONG WITH HIS WIFE MELINDA, THEY'VE CREATED THE LARGEST PRIVATE FOUNDATION IN THE WORLD WITH $35 BILLION IN ASSESTS WHICH THEY'RE FOCUSING ON IMPROVING GLOBAL HEALTH AND IMPROVING EDUCATION HERE IN THE UNITED STATES. AMANPOUR: What was the personal, mental shift between making all that money and then deciding to give it away? M GATES: I think that's an important thing to understand about Bill and me, which is we knew -- even during the time we were engaged, we talked about the fact that this wealth would go back to society. That was a given between us, because we both grew up in families where volunteerism was really important, giving back was really important. And Bill had thought it was going to be later in his career, in his 60s. But once we started getting going in a small way, it builds on itself. TED TURNER, CAPTAIN COURAGEOUS WHO WON AMERICA'S CUP, MEDIA MOGUL WHO REVOLUTIONIZED TELEVISION NEWS WITH CNN, WHO MARRIED A MOVIE STAR AND WAS INVOLVED WITH THE BIGGEST MEDIA MERGER EVER-- AOL TOGETHER WITH TIME WARNER. WHEN HE WAS SURPRISINGLY FIRED FROM THAT VENTURE, HE REINVENTED HIMSELF WITH A SECOND CAREER AS PHILANTHROPIST---- AND IN 1997, HE STUNNED THE WORLD WITH ONE OF THE LARGEST DONATIONS IN HISTORY, ONE BILLION DOLLARS TO CREATE THE United Nations FOUNDATION. AMANPOUR: Was it scary to give a third of your wealth away? TURNER: It is scary because everybody is always afraid that they're going to go broke. NEVERTHELESS, THESE BUSINESS GIANTS ARE NOT AFRAID TO GIVE BACK IN BIG WAY. BUFFETT: I've got everything I possibly need. I've never given up a meal, a movie, a vacation trip, anything in my life. And I've got all this huge surplus. I've got a whole bunch of what I call claim checks on society. Little stock certificates. They sit in a box and have been there for 40 years. They can't do anything for me. They can do a lot for other people if intelligently used. 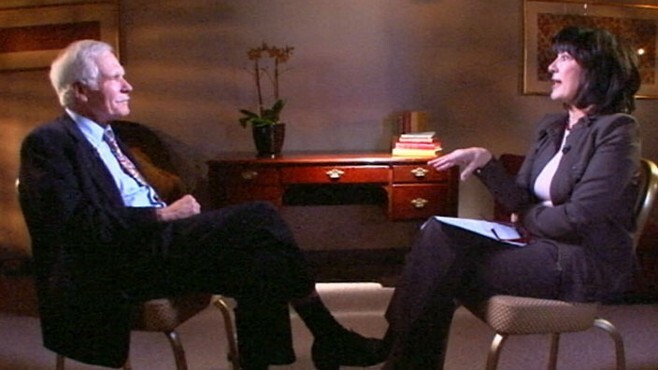 AMANPOUR: you said you won the ovarian lottery. Is that because of opportunity? Was it because of smarts? BUFFETT: It was being born in America in 1930. I was born in the right country at the right time. Bill Gates has always told me if I had been born, you know, many thousands of years ago, I'd have been some animal's lunch because I can't run very fast, I can't climb trees, and some animal would be chasing me and I say, well, I allocate capital. The animal would say, those are the kind that taste the best. You know? AMANPOUR: And how did you get your head around not giving it all to your children? BUFFETT: Well, I just think the idea of dynastic wealth is kind of crazy. The idea that you should be able to do nothing in this world, you know, for the rest of your life and your children and your grandchildren just because you picked the right womb does not really seem to be very American. AMANPOUR: If you're not giving up anything, are you a do-gooder? Are you a philanthropist? BUFFETT: I'm somebody doing something that's very logical to me. And I consider the real philanthropist the person who sticks $5.00 in a collection plate this Sunday and can't go to a movie because of it. Plenty of people do that. They actually give up an extra toy for their kids at Christmas by giving that $5.00 or $10.00. I consider somebody like my sister who spends hours every day working to help other people. They're giving away time which is precious. AMANPOUR: And yet you have called it a moral obligation. BUFFETT: Well, it's certainly an internal obligation. I mean, I don't want to preach morality to other people. But it's -- I don't see any other choice that makes any sense. I mean, I could build a pyramid to myself and I could kill tourism in Egypt. You know, if I spent the whole $40 or $50 billion on building the greatest tomb ever and people would come for a couple of hundred years. But I think that's kind of crazy. AMANPOUR: So would you say you're egoless? BUFFETT: No, I'm not egoless. I take great pride in, you know, what Berkshire Hathaway does if we do well. And, I mean, I like accomplishing things and if I accomplish them, I like other people acknowledging that. So, no, I've got plenty of ego. But I don't believe in spending money that doesn't do anything for me when it will do something for somebody else. BUFFETT IS GIVING MORE THAN 15% OF HIS MONEY TO FOUNDATIONS STARTED BY HIS THREE CHILDREN AND HIS LATE WIFE, SUSAN. THEY TACKLE ISSUES like THE ENVIRONMENT, FAMILY PLANNING, EDUCATION AND HUMAN RIGHTS. BUFFETT: I've told them, they're a failure if they don't have any failures, because if they just do easy things, you know, anybody can do those. They're supposed to tackle tough, important problems and, to some extent, ones where funding is otherwise not available. That's where you make a difference. BUFFETT HAS ALWAYS CHOSEN WISELY WHEN IT COMES TO GETTING THE BEST POSSIBLE RETURN FOR HIS MONEY -- SO THE BULK OF HIS FORTUNE 75% WILL BE INVESTED WITH THE BILL AND MELINDA GATES FOUNDATION. BUFFETT: they have this identical goal that every human life is the equivalent of every other human life. AMANPOUR: Describe how you chose the areas that you chose, and why you chose those when there are so many government programs, let's say, for education or, indeed, for global health. B. GATES: Well, we looked around and saw that the greatest miracle that had happened for everybody on Earth is that as health had improved, it not only saved lives, it reduced sickness, let kids be able to learn. But that also led to the stabilization of the population wherever good health was created. M. GATES: And also, we really started with the premise that all lives, all lives have equal value no matter where they live on the globe. So, that's Bangladesh, or that's Boston, or that's in Britain somewhere. But in the U.S. we feel the greatest inequity is education, that not every child in this country is getting a phenomenal education. And they ought to that's the civil rights issue in our country. SO THEIR GOAL IS TO MAKE STUDENTS COLLEGE READY, AND THEY'RE FUNDING SCHOOL PROGRAMS THAT BOOST STUDENT INVOLVEMENT, REDUCE CLASS SIZE AND ENHANCE THE PERFORMANCE OF TEACHERS. AMANPOUR: Where do you think education can make a change and a difference? B. GATES: Well, the biggest thing would be is if teachers were getting lots of feedback about what they're doing well and what they're not doing well, and if the incentive system encouraged them to teach other teachers when they're doing it well, to learn from others. And so the average quality would go up. BILL AND MELINDA GATES have JUST RETURNED FROM TENNEESEE WHERE THEY GAVE $90 MILLION TO HELP OVERHAUL THAT STATE'S SCHOOL SYSTEM. M GATES: We talked to about 10 teachers who were willing to be videoed in the public school system in Memphis. And they say -- and some of them have been teachers for a long time. And they say, "Watch my video with me." And you sit down and watch the video, and they say, "Look at this. I was doing great teaching this lesson. And look when I lost that boy in the back of the classroom. Look at when I lost that girl. ""I needed to let the kids have a break at that point. I needed to teach my lesson in a slightly different way. And I'm showing it to my other peer teacher to compare our lessons." They want to change the craft of their teaching and get better. And that, I think, is remarkable. AMANPOUR: And does it trouble you that in terms of where American students are, in terms of university graduation, that they're now -- we've gone from 1, now down to 12 over the last several years? M. GATES: You know, if you say, OK, of all the kids that start in 9th grade in high school in the United States, you say, literally, only one-third are ready to go on and succeed in college. We're leaving behind two-thirds of our U.S. kids in the public school system. That, to me, speaks right there to what the problem is that's broken. And it's got to be fixed. You can't have a democracy where only a third of the kids participate. And that's why we're so focused on the issue. AMANPOUR: you talk about democracies which obviously there are elected officials who are meant to be taking care of these kinds of things. Are you stepping in because our democracy is failing in this regard? B. GATES: No. There's been a history in the United States for several centuries now where an approach that's more innovative requires some extra funding to get going. and so the idea of charter schools at first they required extra money and some of these new curriculum approaches require extra money. The work to measure effective teachers, to pay for the videos that Melinda talked about, they're not going to take that out of their normal funds. So maybe they should have more experimental money, but they don't. So the role of philanthropy is to make that possible. Now, they get to decide which of these things really work. And they get to apply the big dollars, which is their regular spending on students, so our role is catalytic to let them see new approaches. WHEN IT COMES TO HEALTH AROUND THE WORLD THEIR FOCUS IS ON DEVELOPING AND DELIVERING VACCINES FOR DISEASES THAT EFFECT MILLIONS OF PEOPLE EVERYWHERE. IN FACT, THEY'VE POURED IN NEARLY $15 BILLION DOLLARS. AMANPOUR: you're hoping to develop an AIDS vaccine. Do you really believe that that's possible? M. GATES: We think in our lifetime we will get an AIDS vaccine. It's not an easy problem, but you have to work upstream. The only way we're ever really going to get at AIDS is with a vaccine. We might get an interim tool for women that they can use, a drug, a pill that they could use to keep them from contracting AIDS, but if you want to solve AIDS, you can't just treat all the people with it you've got to get vaccine. THE FOUNDATION'S PHILOSOPHY IS THAT YOU MUST TAKE HIGH RISKS IN ORDER TO REAP HIGH RETURNS, SO THE GATES FOUNDATION FUNDS CUTTING EDGE AND EXPERIMENTAL VENTURES THAT GOVERNMENTAL AGENCIES BEHOLDEN TO TAXPAYERS MAY NOT. AMANPOUR: What is it about the foundation and how you back ideas that you think you can do that where so many others have failed? B. GATES: The United States government is the biggest funder of an AIDS vaccine. We're, I think, the second, and so there's a lot of different approaches that are getting funded. AND JUST THIS WEEK THE NATIONAL INSTITUTES OF HEALTH ANNOUNCED WHAT THEY CALLED THE MOST SIGNIFICANT BREAKTHROUGH IN YEARS...TESTS SHOW A NEW PILL TAKEN DAILY DRAMATICALLY REDUCED THE RISK OF AIDS AMONG HIGH RISK GAY MEN. IT WAS PAID FOR BY THE NIH AND THE GATES FOUNDATION. GATES: We are particularly helpful when we can gather the right group of scientists, take a long-term point of view and keep the visibility of the impact as high as possible. BILL AND MELINDA GATES' THREE CHILDREN ARE RARELY PHOTOGRAPHED BUT HAVE TRAVELED WITH THEIR PARENTS ON THEIR OVERSEAS TRIPS. AMANPOUR: How do they react when you take them to some of the abject poverty that exists in this world? M. GATES: I don't think you can go into an AIDS orphanage and not leave a changed person. And so even though the orphanages that we've been in, in South Africa, with them look really nice, they know at the end of the day, when we leave, those children don't have any parents. And that affects a child deeply. CHRISTIANE: most people assume that they're going to leave whatever they've made and whatever they've done to their offspring. But you don't feel that way. B GATES: I don't think it's a favor to a child or to society to have immense amount of wealth bequeathed to them simply because of the family they're in. You know, they want to develop their own identity, their own excellence. And clearly, they're going to get some benefit in terms of going to great schools and broad exposure, but then have a chance to make their own way. M GATES: and I think what we've tried to instill in our own kids is that with great wealth comes incredible, enormous responsibility. BILLIONAIRE TURNED PHILANTHROPIST TED TURNER AGREES AND HE'S PLEDGED THE MAJORITY OF HIS MONEY TO THE UN FOUNDATION TO HELP ERADICATE POVERTY and DISEASE AND TO THE NUCLEAR THREAT INITIATIVE ELIMINATE NUCLEAR WEAPONS. TURNER: I don't believe it's really healthy to pass on fortunes to children just because they're your children. They're not necessarily more worthy than anyone else -- and if they get everything from their parents or from the previous generations then their life doesn't have the kind of meaning or the challenges that being able to make it on their own does. AMANPOUR: what was your highest net wealth? AMANPOUR: How did you stomach that? TURNER: I lost $10 million a day every day for three years. I stayed with Time Warner because my family and friends had a lot of stock in the company and I was on the board and I just -- I was like the captain of the Titanic. I went down with the ship. It hurt because I worked hard to get that money. I've worked hard. Like that song, "She Works Hard for her Money." That was my theme song. AMANPOUR: How did you triumph over that? TURNER: I just -- I hung in there. But I had a rough couple of years. I lost most of my fortune. I lost my job. I lost my wife, and I lost a grandchild, passed away. All in the same year. And I thought about giving up. But I couldn't give up because then what would I do? I wasn't going to go -- quitters never win and winners never quit. I remember -- that's kind of been my slogan for a long time. AMANPOUR: Did philanthropy fill a void? AMANPOUR: when you gave the money to the United Nations you said, I want to put all you rich people on notice. I'm coming after you to give more money. TURNER: Well I said that and just by saying that, it caused a lot of people, I'm sure, to think about it. AMANPOUR: did you know Bill Gates and Warren Buffett before that? AMANPOUR: What did you want them to do and others like them? TURNER: Well, to consider giving now. They were already considering giving. Everybody who's rich has considered -- considers it. It's just a question of whether they do it or not because it's so much easier not to do it. But Bill and -- Bill Gates and Warren with this Giving Pledge, they're out there really taking a leadership position and I'm proud to know them and be partner with them because we do -- the U.N. Foundation and the Nuclear Threat Initiative does a number of joint projects with both of them. AMANPOUR: You just mentioned N.T.I., the Nuclear Threat Initiative. TURNER: Right. That's the one that focuses on weapons of -- getting rid of weapons of mass destruction and making sure they're not used in the meantime and making it a more peaceful and safer world. AMANPOUR: And yet, that should be the role of a government. TURNER: It is the role of government. But governments can stand help. Governments are like everybody else. Everybody needs helps sometimes no matter how rich and powerful you are. And that was the thing. I did not know for sure when I started that it was going to work, that the U.N. Foundation was going to be able to help the U.N. or the Nuclear Threat Initiative was going to be able to help the U.S. government. There were a lot of things that weren't getting done that are getting done now, done more quickly and it really has worked out. And not only are -- is our foundation helping, but now you have lots of corporations that are helping the United Nations and you have lots of NGOs that are helping. AMANPOUR: You did something in Yugoslavia with Nuclear Threat Initiative. Why did you have to step in and secure the Yugoslavian nuclear materials? TURNER: Because our government didn't really have the way to raise that last $5 million. They were $5 million short for transporting and blending down the highly enriched uranium that Serbia had. It was very dangerous. It was being held in a museum. It wasn't being properly supervised. It could have been stolen by a terrorist or -- and it was enough to make several big bombs. AMANPOUR: And the United States government did not have $5 million? TURNER: Well they didn't -- it didn't fit the rules that they have. So we came up with $5 million. I'm older than he is..."
AND HE'S JOINED on AS AN ADVISOR TO THE N T I.
TURNER: I delivered a Washington Post Extra when they dropped the first atomic bomb. But I read what Einstein said four days later was this has changed everything in the world, except how men think. And in the 1960s, I was giving money to that. The hard part about that is translating money into something that really does attack the problem. You really get into governments and I don't know how to use big money to really change the world in that respect. I've got a $50 million challenge out now to the IAEA on a program for a nuclear fuel bank. But, basically, that's got to be done by governments. And money just doesn't -- it doesn't buy as much in some areas of philanthropy as it does in others. AMANPOUR: It's exhausting saving the world. TURNER: Saving the world is a hard job. AMANPOUR: What would you say to people who don't have so much money, should they be doing that too? AMANPOUR: I don't believe you. TURNER: I swear to God. Absolutely. I pick up trash in Atlanta. TURNER: Because I want to set a good example. President Kagame of Rwanda has passed a rule that on the third Saturday of each month, the entire country has to go out from 8 - 11 and pick up trash, including him, and the cabinet of Rwanda. They all go out and pick up trash and Rwanda is just as clean a country as Switzerland is. AMANPOUR: What about your father made you take these risks and aim so high in your life, whether it was starting CNN, whether it was winning the America's Cup, whether it was being for environmental control before that was cool, or nuclear disarmament before that was cool? TURNER: you only have one life, you might as well make it interesting and you might as well aim high. You know, it's -- try to do as much as you can. 32:00 But basically I didn't have a lot of fear because I thought things through very carefully before I did them and I felt like I wasn't really taking that big a risk. WHEN WE COME BACK, SOME OF THE BILLIONAIRES WHO ARE SIGNING ON TO THE PLEDGE - PLUS WE'LL ASK BUFFETT GATES AND TURNER WHEN THEY EXPECT JOBS TO COME BACK FOR AMERICANS, AND WHETHER THINK AMERICA CAN COMPETE IN THE WORLD. Buffett: It is not a zero sum game, you know. I mean, we, the fact that penicillin was discovered in England has been great for people in the United States. If they come up with an electric car first or whatever that works, the important thing is that benefits of the world's innovation flow to the whole world. BACK NOW WITH OUR SPECIAL EDITION OF THIS WEEK - THE GIVING PLEDGE - HOW THE WEALTHIEST AMERICANS ARE MAKING A MORAL COMMITMENT TO GIVE THEIR BILLIONS BACK. IN PART TWO WE ASK BUFFETT, THE GATES AND TED TURNER ABOUT SOME OF AMERICA'S BIGGEST CHALLENGES. AMANPOUR: Does there need to be a sense of sacrifice in the United States? BUFFETT: there's no sacrifice among the rich. There's plenty of sacrifice going on now. I mean, if you look at Iraq and now Afghanistan, there's been sacrifice. But I would doubt if you take the people on the Forbes 400 list -- whether many of them have a child or a grandchild that served in Iraq or Afghanistan -- they come home in body bags to Nebraska, but they don't have to call up anybody up at the country club to notify them. WARREN BUFFETT CALLED THE FINANCIAL meltdown IN THE FALL OF 2008 AN ECONOMIC PEARL HARBOUR. AND HE's given CREDIT TO THE FEDERAL GOVERNMENT FOR SAVING THE ECONOMY. "IN THIS EXTRAORDINARY EMERGENCY," HE WROTE YOU, MEANING THE GOVERNMENT CAME THROUGH - AND THE WORLD WOULD LOOK FAR DIFFERENT NOW IF YOU HAD NOT." BUFFETT SAYS HOWEVER, THAT THE ECONOMY STILL HAS A LONG WAY TO GO BEFORE IT COMES ROARING BACK. AMANPOUR: Is there a magic bullet solution even though it's not something that can be cured in a week, But can people look forward to full employment...in a few years? BUFFETT: They can look forward to their children living better than they lived and their grandchildren living better. But it will come back slowly. I mean, it's not an easy thing. If I had a great idea, believe me, I'd have been raising my hand wanting to come on your program earlier to tell the world about it. I don't have any brilliant ideas on it. I do know that business is coming back. When business comes back, employment comes back. And the genius of the American society has not been lost. AMANPOUR: how does the United States, in this situation, generate jobs, compete with China, India, and actually bring those jobs to Americans? B. GATES: Well, there's not a fixed number of jobs. The fact that other countries are doing well actually creates opportunities for jobs. The question for us is, are we educating people well? That's the number one thing. If you want to look at economies improved created a lot of jobs, even just look within the unemployment figures. Look at the college-educated unemployment versus, say, high school only, versus dropout, and you'll see that the education system is what's out of whack. The demand is there if you have the right skills. That's not an immediate solution, but for tough problems like this, you really -- it's only by looking at the long run that you solve it. AMANPOUR: since you are known as a very clever and savvy entrepreneur. You took many risks, you embodied the American Dream if you like. Today there are major problems with the middle class, with the small businesses. How would you advise kick-starting the economy today? AMANPOUR: Do you see a way out of this? TURNER: Yes. We're doing it right now. We're correcting things. We've already paid off $1 trillion of our debt in the last couple of years by not borrowing so much. We're cutting down on our borrowing and people are cutting down on their expenses. But, you know, prosperity will return. It always has and I think it will. AMANPOUR: Do you see austerity necessary? Like Europe is doing deep cuts, rising taxes? TURNER: Yes, yes. We were spending too much. And that's what the conservative movement has said we spent too much. You know, I'm not exactly sure where is too much but some places. AMANPOUR: Where do you see the next big innovation coming? BUFFETT: well you don't see it.... you know at the start of the 1980s -- we thought Germany and Japan were going to eat our lunch, and all we were going to do was flip hamburgers and cut each other's hair. And then we created 20 million new jobs. I didn't know where those 20 million were coming from. And maybe the people that created them didn't know. But we've got a genius to the system that creates jobs. AMANPOUR: you're an innovator. Where do you see innovation here coming? AMANPOUR: How does one innovate again in the United States? TURNER: Well, there's a lot of innovating being done right now. I just came up this week from a conference on mobile health and what's being done with cell phones in the developing world to transport medical information to people and to gather it. It's just absolutely amazing the things that are being invented. Now, they're not all being invented by Americans, but some of them are. America never had a monopoly on brain power. We had -- we've been very successful but on top of that, as time goes on and you get more and more successful, that leads to some complacency and you have to go -- that's why you have cycles. The stock market goes down some days and goes up some days. AMANPOUR: where do you see America in the next two years, five years? BUFFETT: Well, the two years, I don't know. I mean, I don't think -- we will be better off two years from now than we are now unless there is some nuclear, chemical or biological event. But the one thing I'm absolutely sure of is that the best years of America lie ahead. There's no question about that. But what has worked for 200 and some years is going to keep working and we have unleashed human potential. We aren't smarter than those people around the Revolutionary War time, you know we don't work harder. We just work more effectively. And that will keep on and on and on and we'll turn out more and more goods and services. And I just hope they get more equitably distributed in the future. SOME CRITICS COMPLAIN THAT THE MEGA RICH MIGHT SOMEHOW BE TRYING TO SHAPE GOVERNMENT POLICY WITH THEIR BIG DOLLAR DONATIONS. TURNER: I was opposed to the latest ruling that corporations can give unlimited amounts of people running for public office....the richest will be able to buy the elections and I don't think they ought to be the case. I think that our government should be run by the people and for the people, that democracy is important. And I'm very concerned about that. And I hope that Congress will overturn that at some point in time. AMANPOUR: what about climate change, you're putting a lot of money into trying to get environmental control. TURNER: Yes, but I'm not putting unlimited amounts in. It's limited the amount of giving you can do for lobbying was limited. I think that's good. I do not think that the rich should be able to buy the country. B GATES: In philanthropy, it's very important to have diversity. And so if somebody thinks with the Giving Pledge, or other things, that we're saying, you know, there's only one model, that's a mistake. We love the fact that we sit down and learn from these people things they're doing. And everybody should pursue their own approach. So it's not a monolithic thing. It's about doing different things. But it's still learning from each other. M. GATES: And I think the important thing is to think about how much wealth could go back to society from the Giving Pledge. I mean, that's the enormous positive. The financial dollars that come from the philanthropy I think are the initial wedge to try to the experiments, and then it's really up to the democracy to decide whether to take those on. BUFFETT: there's three things you can do with your money. You can spend it on yourself or your family. You can pay it in taxes one way. Or, three, you can use it in philanthropy. Now, among the three, I take care of myself very well and my kids are pretty well taken care of. I think I should pay higher taxes. But if I'm not going to pay it, I mean, the rest of the money is going to go back to society. It's just a question of whether it goes through the government or whether it goes through a private source. AMANPOUR: What was the reaction there? Obviously, they're not used to -- they've barely just begun to make it. BUFFETT: it amazed me that it was so similar to our experience in the United States. These people talked about their children. They talked about their businesses. They talked about the different role of government there in terms of philanthropy. But they opened up. They were not reluctant to talk at all. Their culture is different. However, they may wish to adapt some of our ideas to what they are doing is fine with us. But we are not there to add another wing to the American operation. GATES we had a lot of very good questions. The government came and the government said they were very enthused about what had happened in the interchange. And the questions were like we get in the United States: "How should you involve the kids?" "What causes really seem like they're impactful?" "How do you find other people to work with?" They're just at an earlier stage, and they'll put their own imprint on it. HERE IN THE UNITED STATES… ITS NOT JUST THE FAMOUSLY RICH THAT ARE GIVING...IT'S THE RICH YOU MAY NOT RECOGNIZE. IN THE LAST THREE MONTHS, 40 OTHER BILLIONAIRES HAVE SIGNED THE PLEDGE.....PEOPLE LIKE TOM STEYER. We want to leave our kids a different kind of inheritance, an example of at least trying to lead a worthy life. STEYER: The invitation to me was a phone call from Warren Buffett. If he thinks it's a good idea, I start with the assumption it is a good idea. B GATES : So we do hope to get more to join in. We think the more the better. In some ways I'll all raise our sights. We all may start a little younger. We all may be a little bolder. We'll find ways to collaborate together. STEYER, DRIVES A 2005 HYBRID HONDA AND FLIES COMMERCIAL BUT THIS EVERYMAN RUNS A HEDGE FUND WORTH $20 BILLION. HE AND HIS WIFE KAT HAVE PLEDGED TO GIVE AWAY MOST OF IT, INVESTING IT BACK INTO THEIR CALIFORNIA COMMUNITY. STEYER: the big new thing that I believe is staring us in the face is sustainable energy. You know, so I'm a huge believer that the thing that America can do, that America can focus on is creating new ways of both generating and using energy. AMANPOUR: Why is America not taking that big chance? STEYER: I think that we're in the very early innings. I would like to do it a lot sooner because I think it's just an enormous part of our economy, it's an enormous part of the world economy, and it's something where we can really lead and build some amazing sustainable businesses with a lot of employment. AMANPOUR: what is it that makes a master of the universe such as yourself want to give away most of your fortune? STEYER: I try and take a lot of pride in being part of my community. And I think that it has nothing, in my opinion, to do with being a master of the universe, but it does have a great deal to do with wanting to be a good citizen and a good community member. AMANPOUR: People are told to work hard, to amass as much wealth. This is a very materialistic world, particularly here in the United States. So to hear that it's not hard to get rid of it all is interesting. STEYER: You know, honestly, one of the things we did was we started a community bank. And, you know, to have a bank, you have to have a bunch of money to get it going. But we felt that a community bank that put money back into the community where people could get loans that they otherwise couldn't get, both businesses, individuals, non-profits, would be something that would make that community a lot better place to live, and at the same time we'd have a very rigorous way of measuring whether we were doing a good job. 01: 07 55 AMANPOUR: So it's not charity per se. STEYER: I think of it as participation. I mean, that is structured in a way so that my wife and I could never make any money, than money went into the bank, and it can never come back. If the bank makes money, all it means is we can make more loans. AMANPOUR: you said that you would be willing to have your taxes higher, many Americans, particularly those who are successful say, hang on, I did this work, this is a capitalist society, this is my just reward. You disagree with that notion. STEYER: I think anyone who doesn't give credit to the system that they are born into is taking an awful lot onto themselves. I mean, I really think that people have sacrificed a lot more than a little tax money to make that system available for all of us. And I would be ashamed of myself if I didn't give some credit to them. STEYER: No. I think the U.S. is great. I think that people need some ideas. I think that they need a strategic sense. But I have enormous confidence in Americans to work hard and to be smart and to do the right thing. AND THERE IS NO SIGN YET THAT THESE PHILANTHROPISTS ARE SLOWING DOWN....OR RESTING ON ITS LAURELS. AMANPOUR: Is the hunger still there? TURNER: Yes. But now I'm hungry for success for the human race and America and all my friends all over the world. AMANPOUR: How do you want history to see you? TURNER: I don't know. I'd like to -- hopefully it'll see me honestly. I believe in honesty so I don't -- and all I'm doing is good so or trying to do good. Even the people that don't agree about getting rid of nuclear weapons think it's a good idea to try. B GATES: there's a certain momentum in terms of the more you hear about other people doing giving, it will encourage you to do more. And certainly all of us who got involved have been inspired by each other's stories, and that rededicates us to getting this money to have the most positive impact. M. GATES: And any time there's talk about giving in a society -- I mean, we're interested not just in the wealthy giving. There's lot of people giving their time or giving small amounts of money even during these recessionary times. So just to have that discussion stimulated for the country I think is an important thing. AMANPOUR: what do you want your legacy to be? BUFFETT: I want to do the most intelligent job I can do, in effect, without respect to whether the recipients are male or female or black or white or Americans or Africans, or whatever it may be, that it has the greatest impact on improving the most people's lives in the future. AMANPOUR: Do you have any plans to retire? AMANPOUR: You're also obviously keen on eradicating polio. And, in fact, one of your executives says that if we don't have a polio vaccine, if we don't eradicate it by 2012, then we will have failed. B. GATES: Well, by 2012 we should be very close on polio. We're 99 percent of the way there if you measure by how many cases there were when this campaign started over 20 years ago. The last one percent is very difficult. And so we're spending a lot of time going around, meeting with political leaders, making sure that there's a little bit of innovation to even take the good old oral polio vaccine and make it somewhat more effective. B. GATES: Well, urban poverty when you first see it can be a bit overwhelming -- the lack of sanitation, the small houses. And, of course, the kids are interested when our kids come in, because they look a little different and there's a lot running around. You know, just to see the way those kids live was eye-opening, and it's got them asking questions on an ongoing basis. AMANPOUR: And how do you think the money that you and your wife have pledged to give away will make you a better citizen and will make the community a better place? STEYER: Well, I mean, we didn't set out to deliberately make this money. We were just pursuing our professional interests. And we also have specific interests in aspects of our community where we feel strongly, where we thought there were things that we could do that would be both interesting and fun and hopefully have a good impact. STEYER: Well, we've tried to think exactly what links them together. I mean, the three things that we do really have to do with trying to work on sustainable energy, trying to work on sustainable agriculture, and trying to -- through a community bank, to put money back into poor community in the West Coast. AMANPOUR: Is it because it makes you feel good? It enriches you? It helps you be happier? STEYER: Well, I think pursuing interesting things that you think are valuable, that's what's fun in life. So do I -- that's what I think get fun out of, is trying to do hard, fun things. AND IT'S THAT spirit THAT THE COUPLE wants TO PASS ONTO THEIR THREE KIDS. STEYER: both my wife Katherine and I had received wonderful educations, and we want our kids to have an opportunity to learn in the same kind of great schools we did. But after that we feel like it's their responsibility to make their own life, to be who they want to be. Not to be our kids, per se, but to create their own reality. AMANPOUR: And what was their reaction? STEYER: Why are you telling this? We already figured this out long before you brought it up. STEYER: They were -- I think they were years ahead of us in thinking that they knew that being somebody's offspring is not the way to go through life. 16:45 AMANPOUR: your grandmother used to read you a poem by Alfred Lord Tennyson. AMANPOUR: Do you remember it? STEYER: it's about Ulysses after he comes back from the odyssey, after he is the king of Ithaca again and he decides to take all of his old men and set sail to try new places, new boundaries, see what they could do, and, you know, never to give up. And I thought that was -- she was 86, she had about a month to live. I thought that was a great attitude. AMANPOUR: So never rest on your laurels. STEYER: resting on your laurels is really boring. As long as you're trying something new and sailing into new seas, you have a chance to learn something and do something new, and that's what's really fun.